On October 2, 2006, a shooting occurred at the West Nickel Mines School, an Amish one-room schoolhouse in the Old Order Amish community of Nickel Mines, a village in Bart Township, Lancaster County, Pennsylvania. 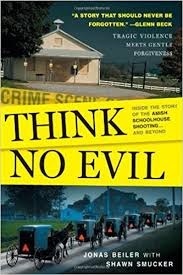 When the gun fell silent, ten young Amish girls aged six to thirteen would be shot, five of them fatally. The shooter, local milk truck driver Charles Carl Roberts IV, committed suicide in the schoolhouse. In the aftermath of this senseless slaughter of innocents, the reaction of the Amish community stunned the world. These were people who had buried children due to an insane person with sick fantasies. More of the girls would have a long road to recovery. The psychological damage to the community, especially the children cannot be measured. The one thing the community wanted the world to know was that they thought no evil of Roberts. He must be forgiven, and his family must not bear any blame. In fact, the community would go out of their way for Charles Roberts’ family. It is odd to be invited to an Amish funeral, but Roberts’ family was asked to attend the girls’ service. As far as the community was concerned, Roberts’ had an illness and was not in control of himself. I was highly inspired to take a look at myself and wonder if I have practiced forgiveness.